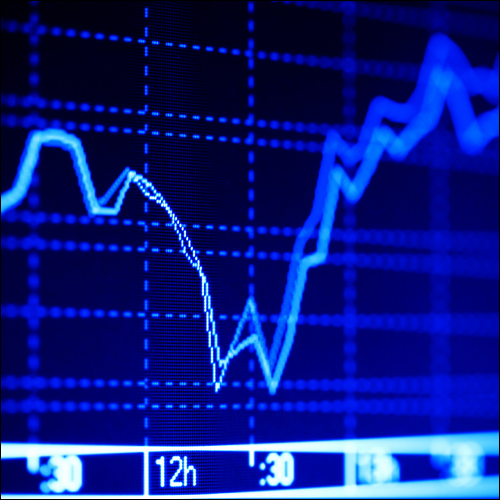 With Financial Spreads, clients can add Trailing Stop orders to their spread bets and CFD trades. How Do Trailing Stops Work? A normal Stop Loss order, on a spread bet or CFD, is designed to protect a client when the market moves against their trade. If the market does move against a trade, and crosses the Stop Loss level, then the order will close the trade and prevent any further losses. Whether you are buying or selling a market, a Trailing Stop order works like a Stop Loss order but automatically tracks your profitable positions. If the market moves in your favour, the level of your Stop Loss will also move in the same direction. This can help you lock in any profits. Also, because these orders are automatic it means that you don't have to continuously monitor your position and adjust your Stop order manually. There are no extra charges for opting for your Stop order to be a Trailing Stop. Trailing Stops are available on most, but not all, markets. Trailing Stops are not guaranteed and the markets can, on occasion, slip through a Trailing Stop / Stop Loss level. If this happens the trade will be closed at the next level that the market is traded. It is not possible to have both a Trailing Stop and a Guaranteed Stop. 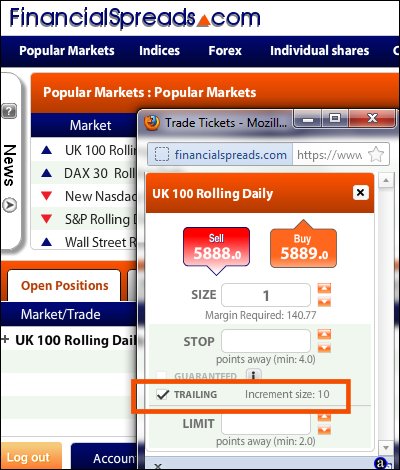 A client might speculate on the UK stock market to rise and therefore buy £5 per point of the Financial Spreads UK 100 Rolling Cash market at 6,850 and set their Stop Loss order at 6,805. They could also choose for the Stop to be a Trailing Stop and select a 'Step' of 10 points. In this case, with the Step set at 10, if the UK 100 continues to rally and doesn't fall back, then for every 10 points the market rises, the Stop will also move 10 points higher. E.g. if the UK stock market moves 10 points higher to 6,860, the Trailing Stop will jump 10 points higher to 6,815. If the UK 100 then moves another 35 points higher to 6,895, the Trailing Stop will jump up 30 points to 6,845. It increases by 30 points, and not 35 points, because the Trailing Stop only moves by whole increments of the Step. If/when the UK 100 does turn lower, the Trailing Stop will remain at the last level it stepped to and act as a normal Stop Loss order.